Green fingered volunteers have been working with Green Sefton to help spruce up the lake at Coronation Park in Crosby. As part of the ongoing Year Of The Volunteer campaign, dozens of volunteers from the Friends of Alexandra & Coronation Parks joined up with the Coronation Park Boating Club & Green Sefton to remove tons of rubbish from the lake. A volunteer also constructed a small bird house to be placed on the lake to help protect wildfowl. While clearing out the lake on August 8, the Green Sefton team also came across a sick duck who could not fly and took it to a local bird rescue group to nurse it back to health. 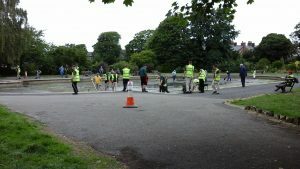 Cllr Trish Hardy, Sefton Council’s Cabinet Member for Communities and Housing, said: “This was a fantastic group effort as part of the Year Of The Volunteer and we managed to fill an entire truck with the rubbish we pulled from the lake. “The support volunteers gave to our Green Sefton team was vital and we are so proud to have such a dedicated team of people who want to help us keep Sefton a clean, green and beautiful borough. For more information about the Year Of The Volunteer visit www.mysefton.co.uk.